The 12" Drip Pan is perfect for your large hanging baskets. Using this Drip Pan will save you time. No more having to water your hanging baskets every day! During the hot summer months you may have to water once or twice a week. This Drip Pan attaches easily to your hanging basket. With this drip pan there is no cleaning up water drips. This Drip Pan comes with 4 metal hooks. The holes are already in the clear pan. Simply hook on end into the hole of the Drip Pan then bend the straight end over the lip of your hanging basket. So simple! 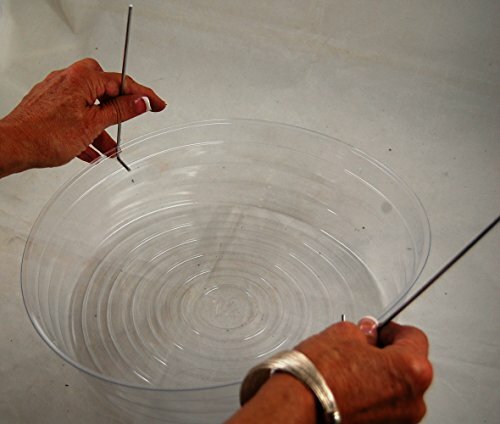 12" in diameter and 3 3/8" deep Clear Vinyl Drip Pans designed for large hanging baskets. The Clear Drip Pan will allow your decorative hanging basket to show through. No spills or water to clean up when watering. The metal hangers allow you to custom fit to your hanging basket. Easy attachment. Will save you time in watering patio or inside plants. Eve's Bonsai Humidity Drip Tray 11" x 13" Overall size 11" x 13" to fit a 9" x 11" on the bottom of the pot.